An exciting continuation to the Hunted and Hunter series by Dragonfiremalus, enjoy! They came when I was out hunting. I stormed out the back of my house, running from another of my father's lectures. He said the same thing over and over. "Do something with your life." Well I was trying. But no matter what I settled on it wasn’t good enough for him. So I walked out, to be alone in the forest. I took my rifle and began trekking through the trees far from our small, frontier town. At first I was just annoyed at the idiot pilot skimming low over the treetops, scaring away the prey for kilometers around. But then I caught a glimpse of the blood red Cutlass. I saw him, and he saw me. In an instant I turned from hunter to hunted. I ran. Sprinted through the shadows underneath the canopy of leaves. Branches whipped past my face. I slid down a steep embankment to a small creek, splashed across, and scrambled up the other side. Ship engines roared overhead, sweeping over the treetops. A spotlight shone down through the darkness, and I turned to stay out of the light. If I could keep going for long enough, perhaps there was hope. My lungs burned and my legs ached, but I had to keep running. They were coming. I woke up in a cold sweat. My hands were shaking, my heart pounding. I had been dreaming, but couldn’t remember what about. It had to have been bad, though. My breathing was heavy and I couldn’t get it under control. I sat there shaking, sweating and panting, feeling an oppressive sense of urgency. I didn’t know what caused it, but I knew what could fix it. I reached over and yanked one of the autoinjectors from my pack, jabbing it into my arm. The cool calmness was sweet relief, the urgency was gone. There was no reason to be afraid. Nothing was coming. I was alone in my room... safe. Everything made sense, the world so simple; the turnings of cause and effect were so obvious, playing out in my head. "Wake up, Pup." A hand grabbed my shoulder and I reluctantly rolled over. Ajax stood by my bunk in the dimly lit room, hand still resting on my shoulder. I rubbed my eyes and looked around the room. Ajax was fully dressed in his customary light combat gear and worn jacket, pistol strapped to his side. "What time is it?" It felt early, but it was always hard to tell underground. "0500," Ajax said. "Something's up, captain wants us in the hangar." I clambered out of the small bunk and dug out some clothes from my footlocker, hurrying after Ajax as he strode off down the metal corridors of the outpost. "I can hear you most nights. You're not sleeping well," Ajax said as we walked. "I could get you something to help, if you want." "No, it's fine." I gave a weak smile. He wasn't convinced. "I'll be alright," I assured him. "Things have just been stressful, we've been so busy lately." "All the more reason you need a good night's sleep," he said. I looked at his stern face and bright eyes. There was something almost grandfatherly about him. I nodded, giving in. The hangar, which usually seemed so empty with only a Cutlass or two, now looked overstuffed. Cobra, the gang's Caterpillar, was there, alongside Draconis, Captain Brannigan's Redeemer. But that wasn't so unusual, not like the strange, curving hulk of the Banu ship that was with them. Stepping down from the vessel were two of the aliens, greyish green skin looking almost bark-like, their long faces and protruding foreheads giving them something of a regal look. In front of them walked a fat, bald man I had hoped never to see again. The slave market auctioneer. "Brannigan, my friend!" The fat man called as he crossed towards the captain, whose cold glare showed no intention of reciprocating the affection. "It's been too long." The other mercs were slowly trickling into the hangar to watch the spectacle. "You should know I'm not one for pleasantries," the captain replied. "I let you land because you said you had work for us. So what is it?" "Of course," the fat man said with a small bow of his head. "Perhaps you would like to discuss it in private?" 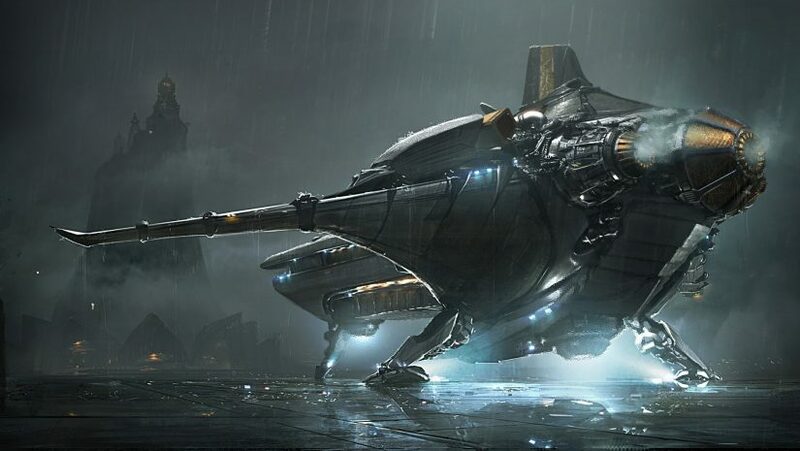 He motioned to the Banu vessel, inviting the captain onboard. Another bow of the head, all accommodating. "Very well. I have told my Banu friends here of your battle skills, and we have a proposition for you. They represent a swiftly-growing business venture in the Sovereignty, and their need for manual labor has outpaced their ability to provide an adequate workforce." Captain Brannigan's face grew darker as he listened. "So they need slaves. Sell 'em what they need and be done, why come here?" "Ah, well," the man's face took on a sorrowful expression, conveying some personal failing. "My stock at the moment is not... adequate for their needs." I began to see the twisted logic of the alien slavers, how they could justify it all to themselves under their morality and own strange laws. If humans did the capturing, then in the Banu’s eyes they would be saving the slaves from their human captors. This debt would then need to be repaid, along with the cost of transportation, living, food, and a dozen other things until the ‘indentured servants’ would never see a hope of freedom. The captain turned to go, but the fat man wasn’t quite done. “I’ll pay you four times the usual!” he shouted. Brannigan froze in his steps. I could see he was actually considering it. But that wasn’t what horrified me. Rather it was looks of absolute glee on almost every mercenary face in the hangar. Even as the cold anger and repulsion burned through me, a part of me admired the skill of the manipulation. Brannigan couldn’t refuse, not now. Not once the offer had been made in front of everyone. For most of the crew that stood around him, it was all about money. And if he turned this much down, that crew would no longer be his.They’d just kill him and go do the job anyway.